Bring back the leaderboard, but it's actually just a JPEG showing random accounts hopelessly far ahead. ^^ & ^ Both great ideas. Then the REAL April Fools is that the traditional blue is actually back for good and we all laugh, and laugh, and laugh. Keep your goats out of the code shed, man. give everyone early 2000's Sephiroth anime banner sigs. Not my goats. Not my pony. Not my monkeys. You'd all have to play along about how great it is to have the old colours return...? The colors have returned, but the change is only supported in the PSP internet browser, which all of us mods are still using for security reasons. US government runs their nukes on floppy disks. You can't hack what nobody uses. I also took the liberty of announcing an important change in the movies/animation/tv forum. I hope the admins will forgive me for stepping on toes and moving forward with this change before checking in with them. Enjoy your April Fools Mods!!! The Admins have been working for literal hours for you all. 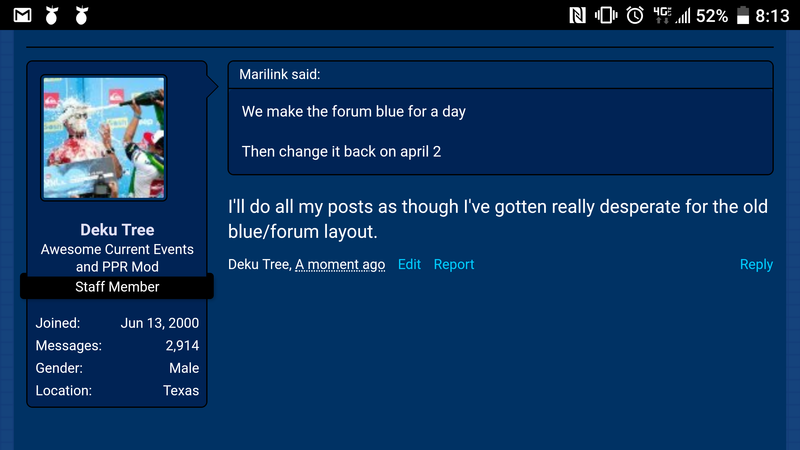 I thought the joke was still going because I changed from prosilver to softblue on my board preferences not too long ago.